Company party, excursion, birthday, it’s all possible on a tram! The only limits are your imagination and our tracks. The Malmköping Museum Tramway: We can arrange a different kind of party, one your friends won’t soon forget! Charter a tram for your party; we’ll arrange hot or cold food, and entertainment, as well. The sunset over Hosjön, seen from a loaded dining table in a warm, cozy tram, is unbeatable. Djurgårdslinjen, Stockholm: The best window seat on Strandvägen, with really old cars (70 years old) and not quite so old cars (45 years old). We take you to the main attractions on Djurgården. We have our own tracks to Vasamuseet (the Vasa Museum), Liljevalchs konsthall (the Liljevalch art gallery), Aquaria, Gröna Lund amusement park, Cirkus, Skansen, and Waldemarsudde, to name just a few. City of Malmö Tramway Museum Society: Treat yourself to the experience of an old-fashioned tram ride! You may want to relive old memories, or to show your children and grandchildren how people got around the city in the old days. We can arrange a trip for a birthday, a private party, a company party, or any kind of occasion. It will certainly be a hit! Norrköping: Service with vintage trams. 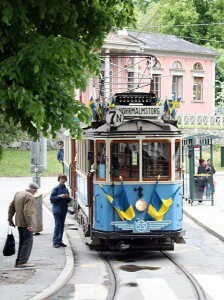 During the summer vacation month, you can ride vintage trams in Norrköping.